This week was once again filled with a series of events combining contemporary art and music, enhancing the beauty of each component. On Tuesday evening I set off to 180 The Strand, ready to experience the record release of Exotourisme – a two-track EP by Dominique Gonzales-Foerster in conjunction with The Vinyl Factory. Gonzalez-Foerster had previously exhibited her eerie holographic OPERA (QM.15) during The Infinite Mix (will I ever stop writing about The Infinite Mix?). Her return to 180 was inspired this time by Ridley Scott’s Blade Runner as was evident by the wonderful use of magenta light which characterised her performance. The two tracks – ‘Des Ombres‘ and ‘Soirée‘ – are classically French in their synthy new-wave ways. Julien Perez who produced the record, opened the show, performing tracks from his upcoming album. Although he is extremely talented and can source darker beats, as demonstrated amply during the night, Gonzales-Foerster’s performance was unsurprisingly captivating. 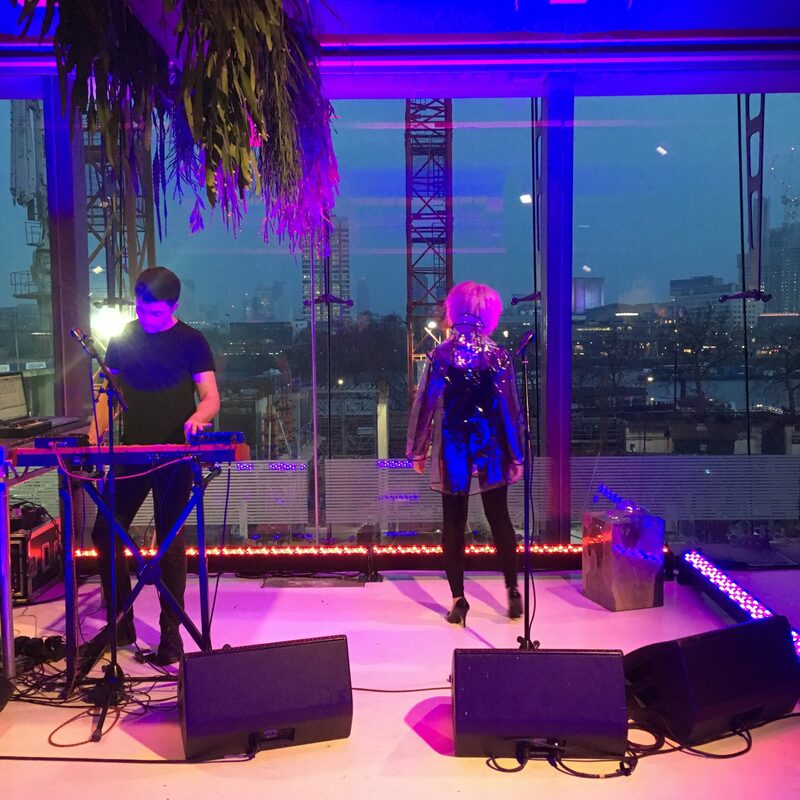 In her transparent rain coat (yet another nod to Scott) she tentatively moved around the stage, occasionally caressing synth wires, touching leaves and glancing out – her back to us – towards the river. The construction site below 180, visible at the start of the performance, soon became distinguishable solely through the red lights which denote crates and similar machinery – proving to be a fantastic fit (although perhaps not quite as futuristic as LA in 2048). Hans Ulrich Obrist stood next to us, storying the performance, as Gonzales-Foerster picked up a transparent mask which added a disturbing element to the song, rendering the show all the more thrilling. 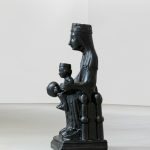 Her new show at Corvi-Mora, Intensité Assouvissante, promises to be just as exciting and will be shown until mid-June so I will be heading to Kennington shortly, naturally listening to the Exotourisme EP. 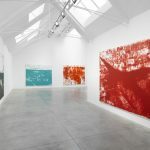 Corvi-Mora’s opening happened on Thursday evening, along with that of just about every single London gallery. 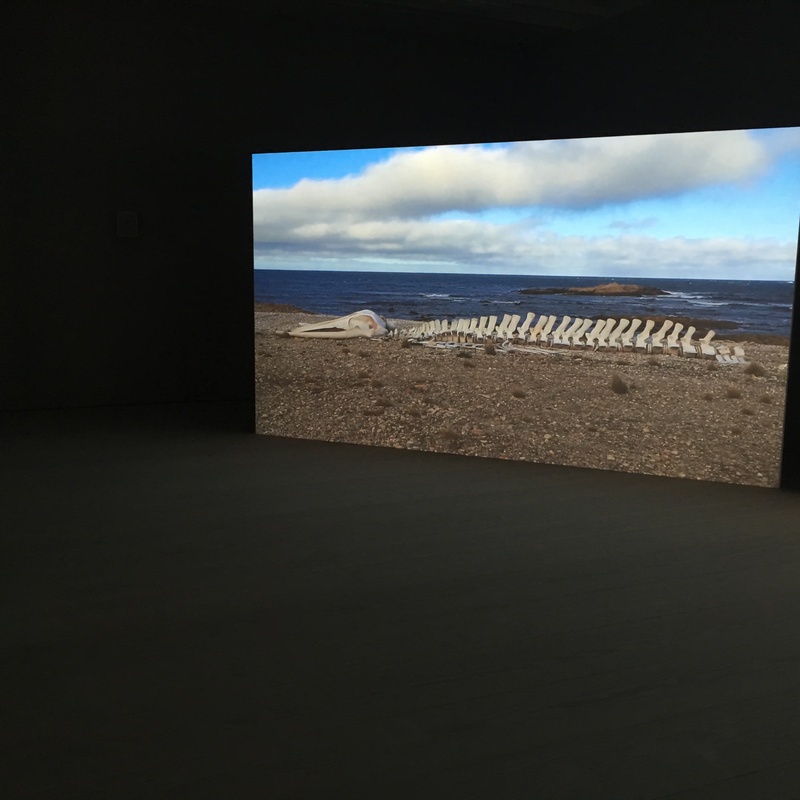 Spruth Magers, Chisenhale, Rosenfeld Porcini – just to name a few. Unable to clone myself, I decided to head over to Marian Goodman for Christian Boltanski’s new solo show, Éphémères. The Parisian artist works with sculpture, photography and film – and his latest installations were no exceptions. Upon entering I found myself in a corridor, La Traversée de la vie, created by veiled panels that I had to gently move to progress. These displayed enlarged 1950s photographs from one of Boltanski’s friend’s photo album. They are discernible, yet only faintly so, giving them a spectral quality. On either side of the corridor we find two films – Animitas (Blanc) and Animitas (small souls). Set in extreme conditions, the first in Quebec and the second in the Atacama Desert, the two films show hundreds of Japanese bells with a tag, resembling planted flowers. Their positioning is far from casual as they match the position of the stars on Boltanski’s birth day. 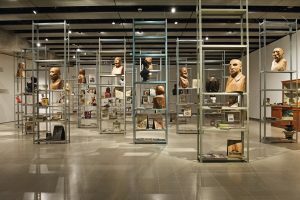 They are accompanied by soothing chimes which echo in the wind and by two sculptural installations which turn the pieces into stage sets, allowing them to appear more tactile and dynamic and facilitating our connection with them. 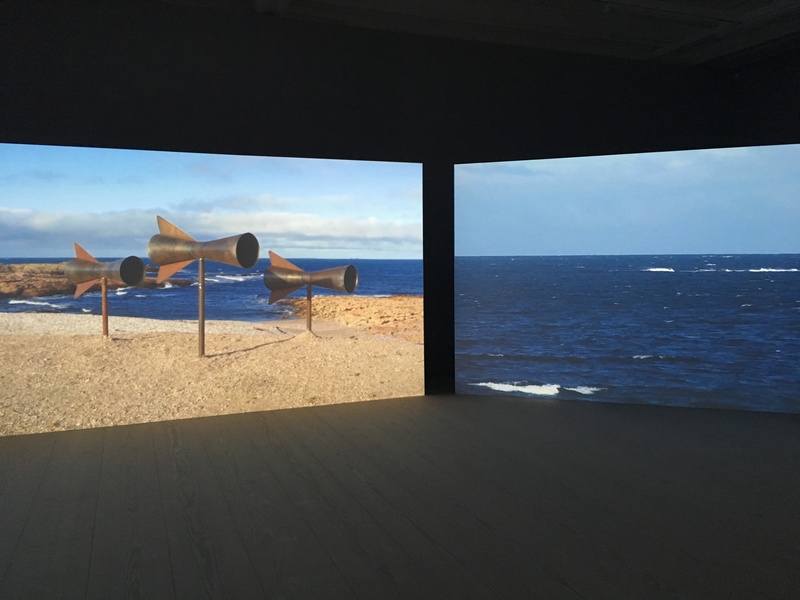 Sound continues to draw visitors upstairs, where Boltanski’s video triptych – Misterios – is being presented. Set in Patagonia, on the coast of Bahia Bustamante, we see three enormous metal trumpets creaking when pushed by the wind. As they produce a lament, resembling a whalesong, we find, on the left screen a fossil on the shore, waves behind it gently continuing their motion, as if singing a lullaby. The same waves become the sole focus of the third and final screen. With Misterios, Boltanski creates an oeuvre whose song speaks of mourning and comfort. The piece, much like the show as a whole, feels more like a collection of poems exploring and evoking spirits and finding solace in doing so. A more experimental soundscape characterised my visit to Andreas Gursky’s retrospective at Hayward Gallery on Friday. 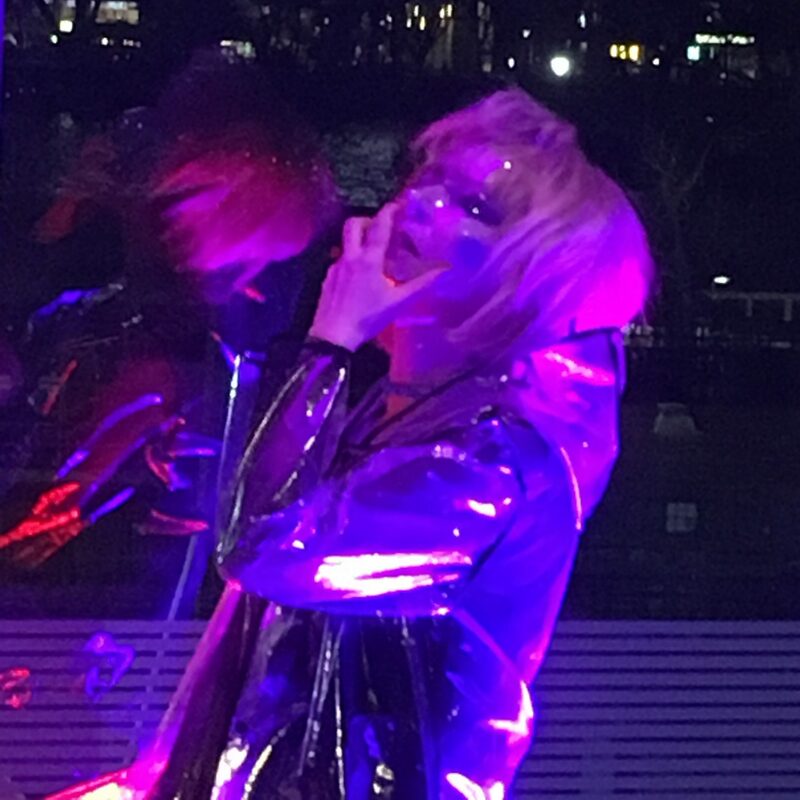 For the first of its Concrete Lates, Hayward Gallery had decided to partner with Boiler Room and showcase three progressive sets from performers who are interested in pushing boundaries and exploring the fault line between noise and techno. During the night visitors viewing Gursky’s monumental photographs were accompanied by Pan Daijing’s original composition which looped throughout the exhibition. These beautifully unnerving sounds mimicked the sensation of being abandoned within one of Gursky’s seemingly infinite photographs – lost in an environment that is at once familiar to us (for instance, a supermarket) and, due to its scale and labyrinthic repetition, disorienting. 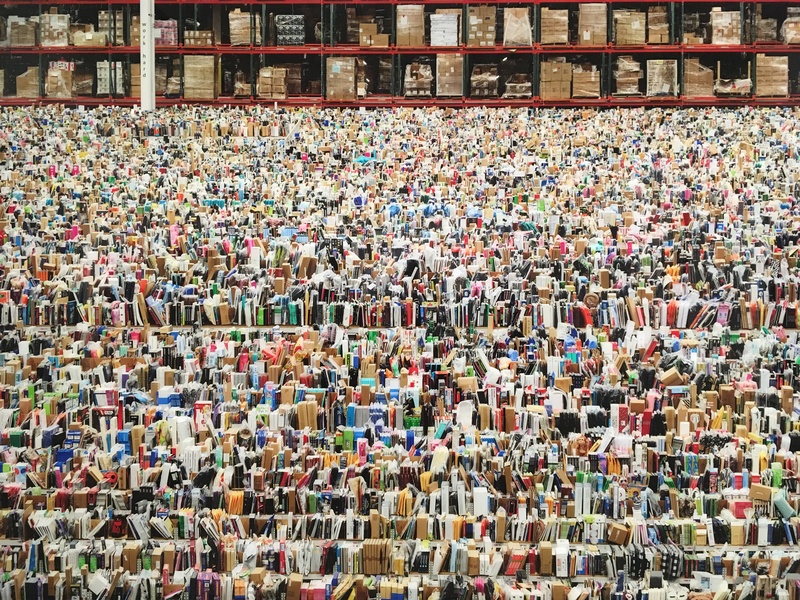 Despite their ability to unsettle, the photographs invite us to spend hours scanning across them, absorbing all their nuances and details, falling into Gursky’s lens and wanting to remain there. 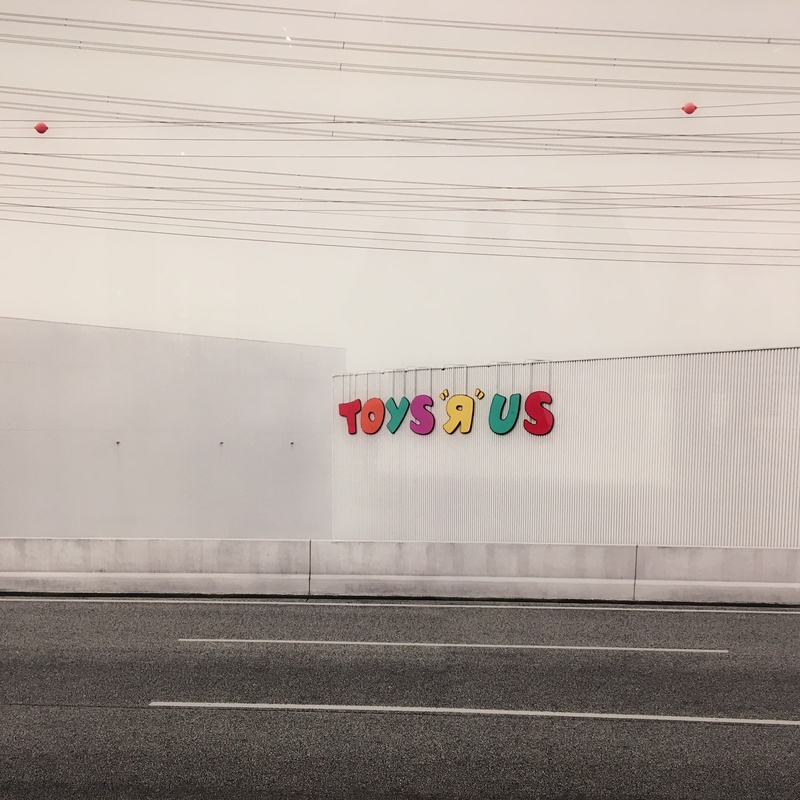 As he explores the relationship between us, our environment and our alteration of it we are guided to see the phantom of Toys R Us, Tokyo’s Stock Exchange and Turner’s chaotic works juxtaposed with their neutral and tidy presentation. 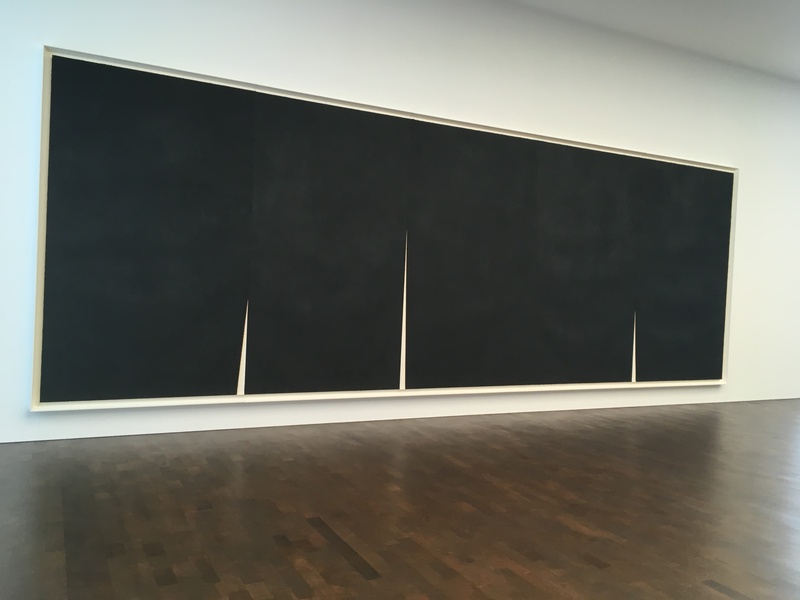 In contrast to the previous three shows, only the faintest of footsteps were audible at Gagosian on Grosvenor Hill yet to me Richard Serra’s latest drawings were pregnant with sounds. In Rifts we see Serra using black as, in his words, it doesn’t transport elusive emotions. Upon entering we are confronted with monumental works composed on handmade Japanese paper. 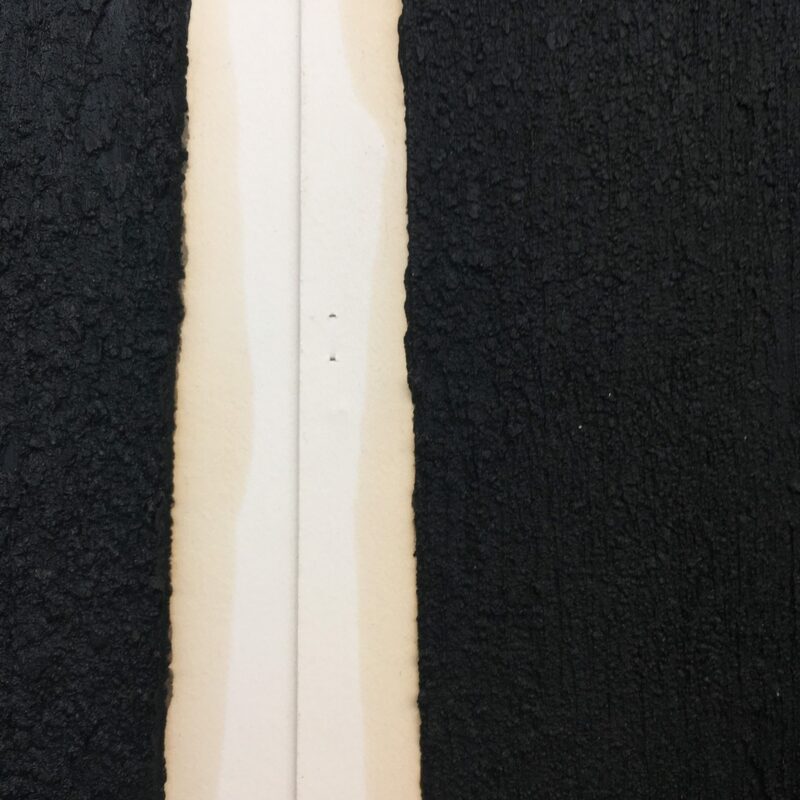 In each one or more rifts are present as the edges of the black-dyed sheets reveal white blank paper beneath them. No two ruptures are ever the same and I spent hours looking at each closely, as some bore marks of a staple, others revealed ink leaks and others still were so imperceptible, the white paper barely shining through a minuscule rift. Whilst Gursky’s large-scale might at times feel alienating, I found Serra’s Rifts to be enveloping and welcoming. The undulated surface, evacuating the earth’s, felt extremely familiar and resembled an unfolded scroll, wanting to be read. As I came closer and appreciated the play of light and shadows over the paper I could not help but think that touching the rifts would reveal an extraordinary song of nature. I clearly refrained from doing so, but the presence of this unearthed and uncovered song haunted me throughout the show as each of the Rift drawings seemed to tease it. Serra allows us the luxury of focusing on fractures through his Japanese paper, which is itself a composite material and in doing so we see just how fluid borders are, bringing beautifully organic elements together. 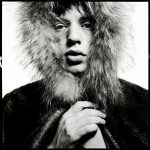 This entry was posted in Art Reviews., EXHIBITIONS, My week in the art world and tagged 180 The Strand, Andreas Gursky, Christian Boltanski, Dominique gonzales-foerster, Gagosian, Hayward Gallery, julien perez, Marian Goodman, Richard Serra, the store x, The Vinyl Factory. Bookmark the permalink.